Show of hands: whose life is going precisely as planned with only good things happening? Anyone? Anyone?? Not sure I see many hands raised. Maybe your life is like mine and others-it doesn’t always go according to script. The path is not always smooth and curve balls often get thrown our way. 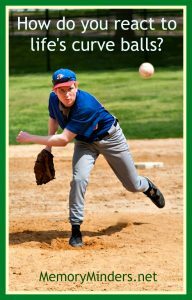 What we do when those curve balls come makes all the difference. 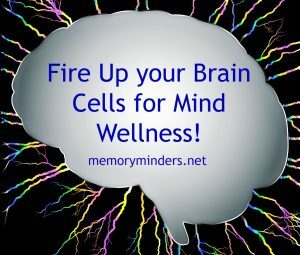 At MemoryMinders, we discuss these factors at length because it really impacts how well our mind and memory function. Are we seeing the proverbial glass as half full or half empty? Some may dismiss this as feel good thinking, but there are many studies proving this to be true. People with positive outlooks perform better cognitively, generally live longer and have a better overall perception of their life. This clearly has an impact on not only our mind but also overall wellness. But how can we do this if our natural bend is a glass half empty mentality? Practice. I will be the first person to say I don’t always see the silver lining. In fact, I usually prepare for the worst, thinking if I’m mentally prepared it will ease the blow. While this may be true, if I constantly live in the what if zone, I cannot fully be present and appreciate the wonderful world in front of me. Life is about choices. What we choose to think about matters. And how we think directly correlates to what we put into our minds. If all we ever put in is negative, guess what? Negative thoughts are all we’ll have. Negative begets negative. And positive…., well you can complete the sentence. I’m not advocating we only see or think about positive things. 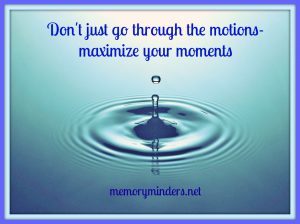 But it is about when and if negative situations come, what our reaction will be. I’m not always the best at this. Ask my family; if there’s an onslaught of bad news, frustration or fatigue, my reactions are not always the most cheerful. But I try. This is when awareness and understanding the concept helps. Recognizing our natural thought patterns can help us adjust, change and manage them. But we need to be aware of what we put into our mind and how it impacts our thinking. For this Mindful Monday, think on how you think. What is your natural reaction when the curve balls come, the clouds roll in or life hands you a bowl of uncertainty? If you’re not always the most positive, how can you change your reaction? What will you do to adjust your mindset today? Chime in with a comment here or on our social media pages and let’s choose to see our glass as half full! Fire up your Brain Cells! In my never ending quest for the latest trends and ideas to help mind and memory, much comes back to the concept of use it or lose it. The idea is this: the more we use our brain, the more brain we have to use. Think of it as a muscle. While the brain isn’t muscle, the analogy applies. The more we use our muscles, the stronger they get. Same holds true for our brain. When we use our brain cells, they are strengthened. They fire, reach out to their brain cell neighbors and communicate as is their job. But like a muscle, if we don’t use our brain cells, they can atrophy and eventually die. This is why mental fitness and using our brain in stimulating ways each day is so important. We want to use our brain so it’s strong when we need it! Read aloud! This may seem easy but try it for longer than a paragraph or two. It takes more concentration to say and think on each word as opposed to skimming or speed reading. It utilizes more parts of your brain than silently reading as well. We did it as kids, we did it with our kids, now do it for yourself. Read whatever you read aloud for at least 10-15 minutes a day-you’ll see how challenging it can be! Use your non-dominant side! Ever try writing, brushing your teeth or eating with your non-dominant hand? It’s difficult. Your brain, like muscle, likes to do things the same way. When you challenge yourself by doing things with your opposite hand/foot/side the brain cells have to think differently. You will challenge a whole new set of brain cells (and muscles) by simply using your non-dominant side for simple things. (For your safety, try this with simple things only-no sharp knife usage!) 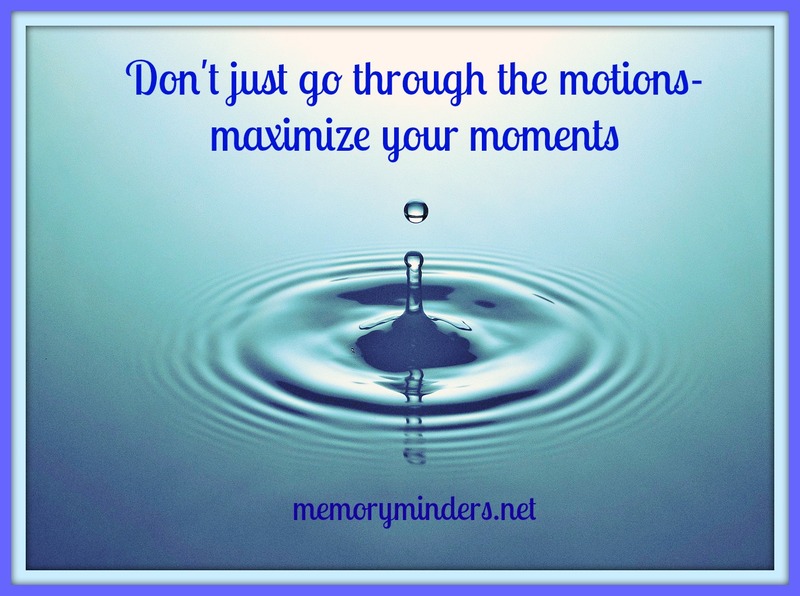 I put my coffee/water glass on my left to remind myself to do this each day! Explore Technology! Whatever you think of technology, it is here to stay. So jump on board and learn new things and make your life easier and more enjoyable in the process. Learning to use a new remote, cell phone or a computer in a new or different way are all great ways to stimulate your brain. New brain training programs are popping up all over, too. While these can be a fun and stimulating way to exercise your brain, they are not necessary. There’s always something new to learn, so seek out help and give it a try! This challenge is certainly helping me learn new computer programming skills! I also tried a new game app this week-difficult but really got my neurons firing! Try something new! We all have our comfort zones with food, people and even how we stimulate our brain. But when we learn something new or try a new way of doing the same thing, we exercise our brain. New things are always difficult at first. But this is how we grow, literally and figuratively. So step out of that comfort into something new and feel those brain cells working! My friend just enlightened me to a new way of playing solitaire-takes it to a whole new level-a new twist on an old favorite! There are many more strategies than this, but as I often tell my clients let’s not make it harder than it is. It may seem like we already knew this, but knowing and doing it are different things! For today’s Mindful Monday challenge: try implementing one or all of these into your day. Don’t be surprised if your mind isn’t fatigued by the workout. 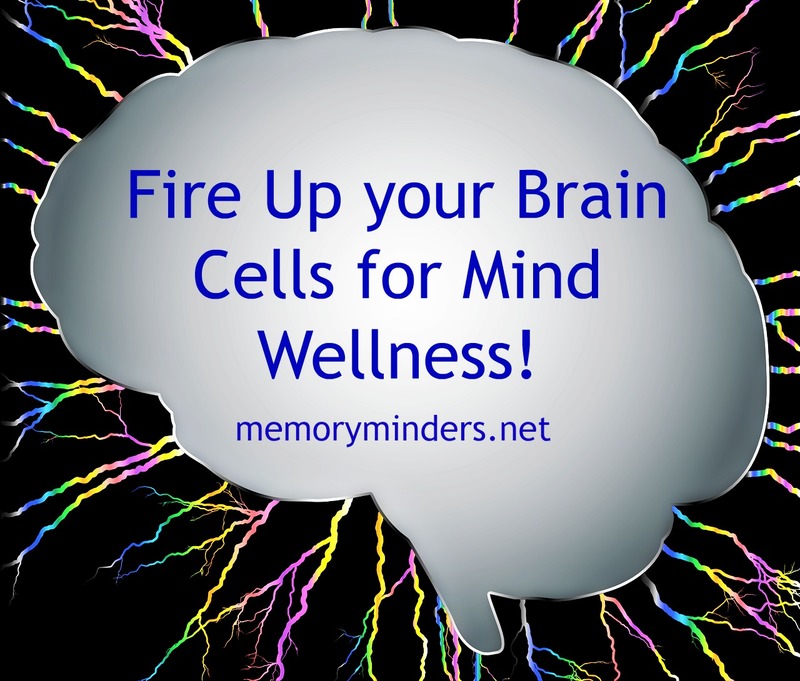 Use your brain in different ways to strengthen it and move toward mind wellness today! Learn or try something new each day. Never stop learning! Focus on one thing at a time, a constant challenge for me! Be more creative in my thinking and actions-step out of my comfort zone! Haven’t joined the Spring into Wellness Challenge yet? Don’t delay-sign up here and challenge your mind, body and soul to wellness today! 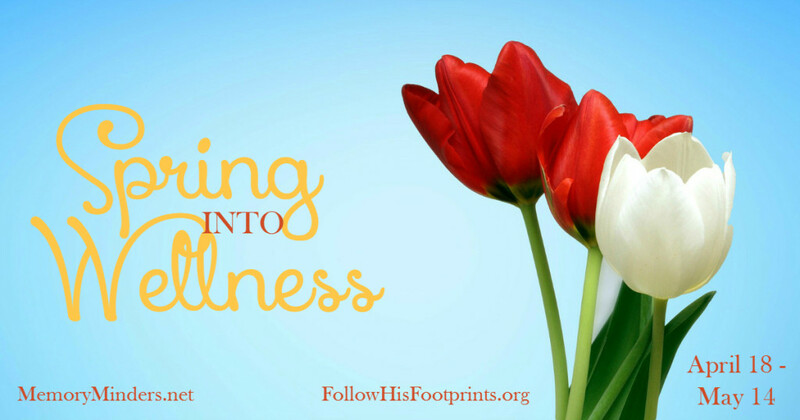 Don’t Fear; Spring into Wellness! It’s one of the scariest things about aging: losing control of your memory. Especially for those who thrive on being on top of things, dementia is their biggest fear. This fear is fueling development of many new and interesting approaches to aging. It currently impacts everything from living options to smart phones apps. While there is no one way to prevent dementia, there are things we can all do to strengthen our minds. This is the mission of MemoryMinders-to assist us all to achieve the best possible mind wellness and quality of life possible. It is estimated we will learn much more about the brain and its influence in our daily lives in the next decades. The continued growth in research in this area is evidence of its importance to the world community. 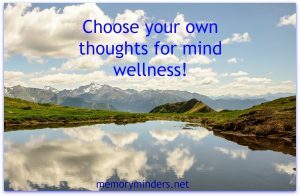 The baby boomer generation will no doubt lead the way in maintaining mind wellness as much as body wellness as they age. The bottom line is we all need to work at mind wellness just as much as body wellness for our futures. Our minds direct our bodies. The brain is not separate from the body. They work in tandem to benefit our overall well-being. Just as you cannot breathe without your brain instructing your body, you cannot fully be well if you don’t consider all elements of wellness. I truly believe in addition to mind and body wellness, there is a third element: the soul, our elemental essence of being. This is the basis of our month long series starting next Monday: the Spring into Wellness Challenge. We’ll explore all elements of wellness and challenge each other along the way! Whether you have felt something missing in your wellness or just need encouragement to reach your goal, I hope you’ll join me! 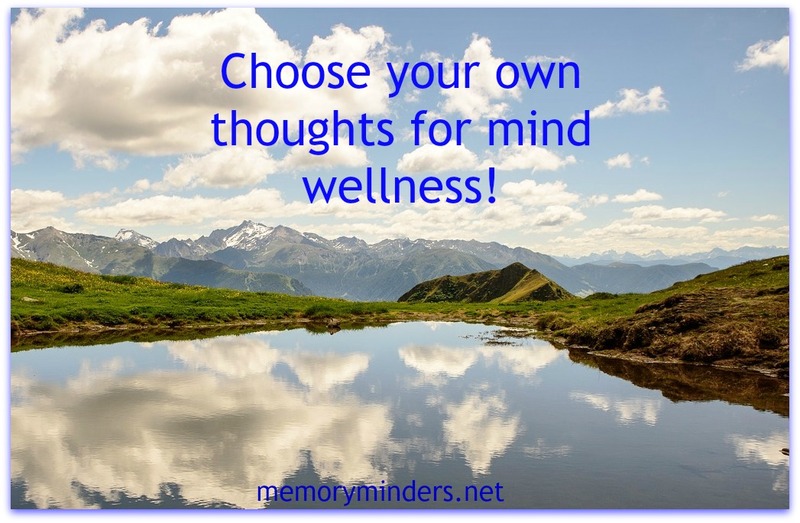 Each Monday I’ll continue to give you mind and memory wellness ideas, strategies and tips. However, if you sign up for the challenge, you’ll receive additional emails on Wednesdays on body wellness, Thursday on soul wellness and fun weekend tips on Saturday. Won’t you join me as we explore all the elements of wellness? Sign up here for the Spring into Wellness Challenge . Let’s challenge each other to reach our ultimate goal: being the best we can be in mind, body and soul!